Offices, manufacturing facilities, schools, universities, and multi-tenant residences have been transitioning from their loaded key-ring to a more secure and convenient form of door access control: integrated electronic locks. New technology has made these highly-secure type of locks affordable, yielding new options to consider between traditional key locks and fully wired systems. Electronic locking solutions used to be unaffordable and unattainable for many, but costs have been significantly dropping in recent years and allow users to secure more doors at an affordable price. Not only are they less expensive to install, but they have a lower total cost of ownership since their maintenance is minimal. Integrated electronic locks are nearly impossible to break into without the proper credentials; newer versions are even pick-proof and bump-proof. Employees or residents don’t have to carry around multiple keys for multiple doors – a single credential can grant them access to all authorized locations. Electronic locks also allow for a secure and convenient management of employees, tenants, and visitors thanks to their communication with a central access control system. Access can be granted, restricted, or denied from a central station or mobile device with ease and in a timely fashion (no waiting to change a lock). Since electronic locks sync up with the central access control system, security and usage data is available to administrators. Although electronic locks generally have a higher up-front cost than traditional keys, they completely eliminate the need for rekeying and significantly minimize the need for ongoing maintenance. Locks also do not need to be installed and reinstalled in the event of a missing key or a break in. There are a few different types of locks available, ranging from traditional key to wired electronic locks. As you move down the list of options, the access control functionality increases. For example, mechanical locks are the least expensive option to install, but also provide very little access control. Wired solutions provide a lot of access control options, but also have a higher cost of ownership. Mechanical locks are traditional key entry locks. They require a locksmith for keying and rekeying and do not provide any electronic access. Keypad and offline systems are the most basic and cost-effective form of electronic locks but they do not provide much more additional security than mechanical locks. Any changes to the access or decisions about access must be programmed at the lock itself, and audit information is either manually retrieved from the lock or generally not available at all. 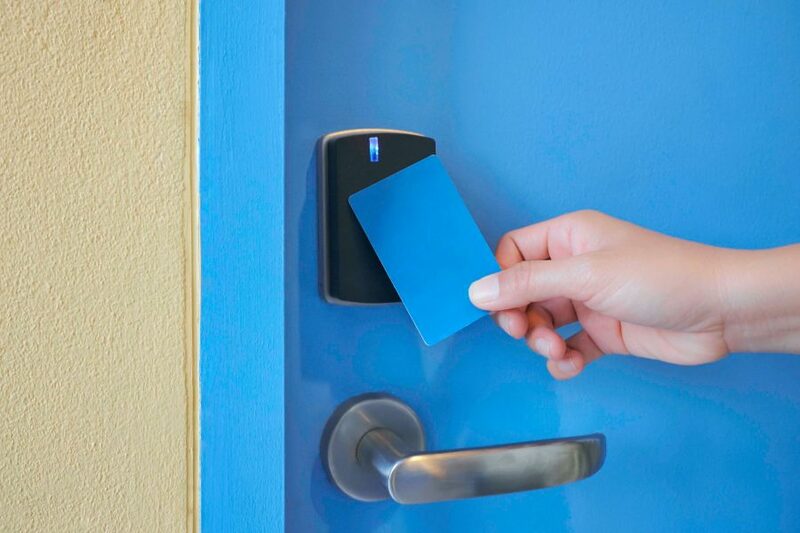 Data-on-card is a popular form of electronic locking because it is cost-effective, secure, and communicates with the overall access control system. Locks can be offline and changes or decisions about access can be pushed to credentials via online devices. These locks are an excellent choice for multi-tenant buildings providing keyless entry for convenience but with the ability to securely control and audit access to various areas within the facility. Newer versions allow the lock to be dead-bolted both from the inside and outside of the door. Wireless integrated locks provide many of the functions of a fully wired system. These smart locks communicate with the rest of the access control system in real time through a wireless hub or gateway. Changes or decisions about the access can be programmed via software, made at the lock, or made in the head end system. Costs of wireless system are lower since each of the doors/locks does not need to be directly wired to the access control system. Wired integrated electronic locks are a new, cost-effective form of providing the most secure form of lock. The integrated smart lock contains all of the traditional electronic locking functions such as card / credential reader, door position sensor, request to exit sensor, and door release. Wiring of these locks is bundled and carried through a channel in the door and electrified hinge. Locks communicate with the rest of the access control system in real time. Changes or decisions about the access are programmed via the access control software. 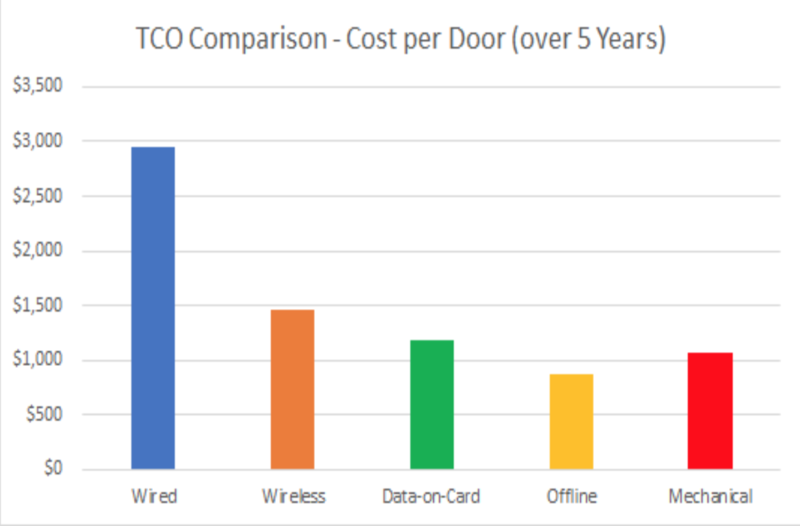 The chart below provides a comparable view of TCO per door for the various locking options over a five year period. The locks represented in this comparison are all Grade 1 locks. The TCO combines the initial acquisition and installation cost with recurring costs assuming a conservative turnover / rekeying rate of 40%. The basis for this comparison is a facility with two main entrances and 48 other doors (50 locks in total). From this, you can see how wireless and data-on-card solutions are closely comparable to mechanical locks in total cost of ownership, but provide security and user conveniences that go well beyond mechanical or offline locks. It goes without saying that every situation is unique, but we almost always suggest some type of hybrid approach for electronic locks. Main entrances to a facility usually need to be the most secure, so we’ll recommend a wired solution. Inner doors or less used entrances do well with a wireless or data-on-card solution. By putting different options together, we can lower the total cost of ownership and have the option to expand the number of fully secured doors in a cost-effective way. TSG Security helps companies in Upstate New York create integrated safety and security solutions that protect their people and assets. Contact us today for more information on electronic locking solutions.